Production: Producers Releasing Corp.; black and white, 35mm, Spherical; running time: 69 minutes. Producer: Leon Fromkess, Martin Mooney (assistant producer); screenplay: Martin Goldsmith, Martin Mooney (uncredited); cinematographer: Benjamin H. Kline; editor: George McGuire; music: Leo Erdody; sound: Max Hutchison; art director: William A. Calihan, Jr., Edward C. Jewell; set decoration: Glenn P. Thompson; costume design: Mona Barry. Cast: Tom Neal ( Al Roberts, alias Charles Maxwell, Jr. ); Ann Savage ( Vera ); Claudia Drake ( Sue Harvey ); Edmund McDonald ( Charles Haskell Jr. ); Tim Ryan ( Diner Proprietor ); Esther Howard ( Holly ); Roger Clark ( Man ); Pat Gleason ( Man ); Don Brodie ( Used Car Salesman ). Awards: Named to National Film Registry, National Film Preservation Board, 1992. Sarris, Andrew, The American Cinema: Directors and Directions 1929–1968 , Chicago, 1968. Truffaut, Francois, The Films in My Life , New York, 1975. Peary, Danny, Cult Movies , New York, 1981. Hirsch, Foster, Film Noir: The Dark Side of the Screen , New York, 1981. Bogdanovich, Peter, Who the Devil Made It: Conversations with Legendary Film Directors , New York, 1997. Schrader, Paul, "Notes on Film Noir," in Film Comment (New York), vol. 8, no. 1, Spring 1972. Combs, R., " Detour ," in Monthly Film Bulletin (London), vol. 49, no. 582, July 1982. Pulleine, T., " Detour ," in Films and Filming (South Croydon, Surrey), no. 335, August 1982. Belton, John, "Edgar G. Ulmer," in American Directors , vol. 1, New York, 1983. Miller, Ron, " Detour to Immortality," in San Jose Mercury News , 16 October 1983. Piccardi, A., " Detour di Edgar G. Ulmer," in Cineforum , vol. 27, no. 261, January-February 1987. Garsault, A., "Un artiste," in Positif (Paris), no. 358, December 1990. McBride, J., "Family Drive," in American Film (Marion, Ohio), vol. 15, no. 11, August 1990. Atkinson, Michael, "Noir and Away. Notes on the Two Detours," in Bright Lights (Cincinnati, Ohio), no. 15, 1995. There are more elegant and ambitious examples of classic film noir—Jacques Tourneur's Out of the Past and Robert Aldrich's Kiss Me Deadly leap to mind—but it's unlikely that you will find a more tightly plotted or single-minded example of the postwar, German Expressionist-rooted style than Edgar G. Ulmer's Detour. Indeed, the argument could be made that this Poverty Row gem distills noir to its basic components: suffocating fatalism, sexual paranoia, the down-on-his-luck patsy/protagonist born to come to a bad end. Detour also contains what for many students is the definitive noir plaint. "It was just my luck, picking her up on the road," says Al Roberts (Tom Neal) in morose voice-over. "It couldn't be Helen . . . or Mary or Evelyn or Ruth; it had to be the very last person I should ever have met. That's life. Whichever way you turn, Fate sticks out a foot to trip you." Of course Fate has less to do with Al's ultimate undoing than Al himself. Fate is noir's all-purpose fall guy. The real cause is Al's obsessive-compulsive personality. A frustrated pianist in a New York dive called the Break O' Dawn Club, Roberts juggles (poorly) dual obsessions: a stalled concert career (he fancies himself a budding Shoshtakovich) and a relationship with the club's pretty vocalist, Sue (Claudia Drake). Sue's decision to try her luck in Hollywood sets up her beau's fall. Eaten alive by those twin betes noires , jealousy and desperation, Al "takes it on the thumb" and follows his worst instincts west. Half of this compact (69 minute) programmer is devoted to Al's misfortunes on the road. In Arizona he is picked up by a obnoxious bookie named Haskell (Edmund MacDonald), who rambles on about a childhood duel and some nasty scratches compliments of "the most dangerous animal in the world—a woman." As Al takes his turn at the wheel, Haskell nods off, has a heart attack, and dies. In the pounding rain, Al, true to form, makes a suspicious situation worse by taking Haskell's clothes, car, and identity. His muddled reasoning: "By that time I'd done just what the police would say I did, even if I didn't." Al gets himself in deeper when he picks up a sullen vixen named Vera (Ann Savage parodying the trampy, consumptive Bette Davis). Vera knows Al isn't Haskell and uses the information to blackmail him into an inheritance scam. Al, thinking only of Sue, resists both the scam and Vera's drunken advances. A fight ensues and, in an all-too-plausible accident involving a phone chord, Al finds himself fleeing another "murder" scene. Unable to buck Fate, he surrenders to it. "Someday a car will stop to pick me up for a ride that I never thumbed," he says as a police car pulls up and a door swings open. "Yes, Fate, or some mysterious force, can put the finger on you or me for no good reason at all." 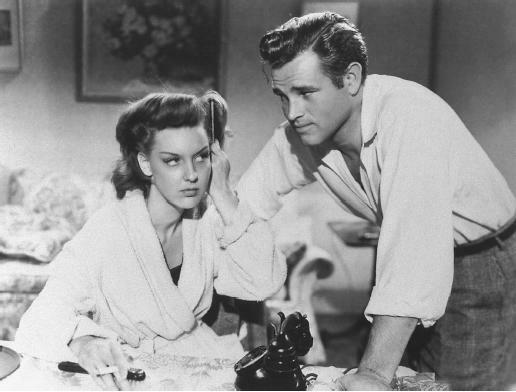 Adapted by Martin Goldsmith from half of his 1939 novel (which unfolds from both Al's and Sue's perspectives) and told in flashback from a Nevada diner playing, mockingly, Sue's hit song, "I Can't Believe That You're in Love with Me," Detour was shot in six days for the notoriously cheap Producers Releasing Corp. The Czechoslovakian-born Ulmer, who had apprenticed with F.W. Murnau before emigrating to Hollywood in 1931, was, as The Black Cat (1934) and Bluebeard (1944) demonstrate, a past master at employing shadows, tight two-shots, and minimalist set design to create ambience and stretch a budget. After a brief rehearsal period, he told interviewers, he could shoot 60 to 80 setups in a day. Forced again to economize, this time on less than $30,000, Ulmer turned Detour into an unrelenting journey down what he called "that long road of Fate." Each element of the mise-en-scene (mirrors, fog, motel blinds, the fuming Vera in profile) serves a distinctly noir overview and sensibility. On the cross-country drive, process shots further distance the already-alienated Al from his surroundings. In the Nevada diner sequences, artificial spotlighting (of Al's twitching eyes) and exaggerated sound underscore Al's agitated mental state. As he surveys the second "murder" scene, Al's disorientation is suggested by a roaming camera that, as it picks out Vera's things strewn about the room, keeps going out of focus. Tracking shots down foggy roads give the impression that Al is on a conveyor belt, being dragged, inexorably, to his final destination. Released by PRC as a routine crime "meller" (the tawdry poster contained the come-on "I Used My Body for Blackmail! "), Detour , like many of the great noirs, was championed by France's Cahiers du Cinéma critics (who dubbed its director "le plus maudit des cineaste" or unjustly cursed) before being discovered by their American counterparts, most notably Andrew Sarris and, in his influential Notes on Film Noir (1972), Paul Schrader. Francois Truffaut, writing in 1956, called Ulmer "the least-known" of American auteurs and his The Naked Dawn (1955) "a small gift from Hollywood." The first observation no longer applies as scholars find references to Detour in Hitchcock's Psycho and, more recently, the noir-infused works of David Lynch and Ethan and Joel Coen. The second Truffaut comment is more applicable to Detour , which, for too long, was an unappreciated gift from 1940s Hollywood. Ironically, Fate wound up putting the finger on some of those connected with this film. Ulmer, confined to a wheelchair after a series of strokes, didn't live long enough to enjoy Detour 's critical reappraisal (he considered it his best film, along with The Black Cat and Naked Dawn ). Widow Shirley Ulmer, in a 1983 interview, said he died a disappointed man. Savage went from low-budget to lowbrow, graduating to such epics as Renegade Girl and Pygmy Island. Neal fared worse. A hopeless alcoholic with a hair-trigger temper, he was imprisoned in 1965 for the murder of his third wife. Perfect tabloid-fodder, he died destitute in 1972 at age 58. An execrable, almost shot-for-shot video remake of Detour appeared in 1992. It was directed by Wade Williams and starred Tom Neal Jr., a dead ringer for his father.